Ferdinand (film, 2017). A 2017 American computer-animated comedy-drama adventure film with "PG" rating by 20th Century Fox. Directed by Carlos Saldanha. Official Trailer. 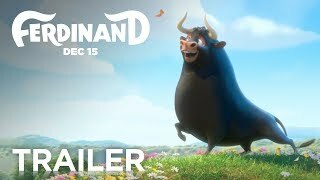 Ferdinand is a 2017 American computer-animated comedy-drama adventure film directed by Carlos Saldanha. 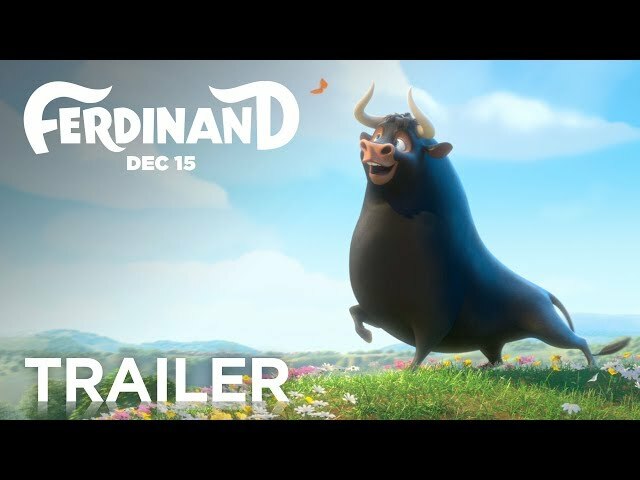 Ferdinand | Trailer | Fox Family Entertainment. In Spain, a ranch owned by Moreno (Raúl Esparza) that trains bulls for bullfighting called Casa del Toro harbours a bull calf named Ferdinand (Colin H. Murphy). He is ridiculed by his fellow calves Bones (Nile Diaz), Guapo (Jet Jurgensmeyer), and Valiente (Jack Gore) for being non-confrontational and his tendency to smell and protect flowers. A saddened Ferdinand runs away from Casa del Toro after his father Raf (Jeremy Sisto) does not return from the bull fight he was picked for and a flower he was fond of was flattened by Valiente after his own father was defeated by Raf. He eventually winds up at a florist's farm in Seville and is adopted by the owner Juan (Juanes), his dog Paco (Jerrod Carmichael), and his daughter Nina (Julia Saldanha) with whom he shares a bond, much to Paco's jealousy. When Ferdinand (John Cena) eventually grows up into an enormous bull, he still retains his non-violent, flower-loving nature. Due to his size, he is left alone when Juan, Nina (Lily Day), and Paco go to Ronda for an annual flower festival. Ferdinand decides to go anyway, resulting in him getting stung by a bee and unintentionally causing chaos around town and is taken away back to Casa del Toro, much to his and the family's sadness. Once back there, he finds that Bones (Anthony Anderson), Guapo (Peyton Manning), and Valiente (Bobby Cannavale) have also grown up and have been joined by a Scottish bull named Angus (David Tennant) and a silent but intimidating bull named Maquina (Tim Nordquist). Ferdinand is still disrespected by the 3 grown up bulls he knew when they were calves, but manages to befriend a crazy goat named Lupe (Kate McKinnon) who wants to be his coach in bullfighting despite his lack of interest, three hedgehogs named Una (Gina Rodriguez), Dos (Daveed Diggs), and Cuatro (Gabriel Iglesias) who frequently invade Casa del Toro to steal food and used to have another brother named Tres, but they claim he is dead, and three Austrian Lipzzans (Sally Phillips, Flula Borg and Boris Kodjoe), who like dancing and tease Ferdinand. The film Ferdinand was scheduled to be released by 20th Century Fox on December 8, 2017 (Dubai), on December 14, 2017 (Germany) and on December 15, 2017 (United States). The duration of the film is 108 minutes. With a budget of $111 million, the film grossed over $296.1 million. Ferdinand got high rating from critics. But the audience dislikes the film. Audiences polled by CinemaScore gave the film an average grade of "A" on a scale ranging from A+ to F.